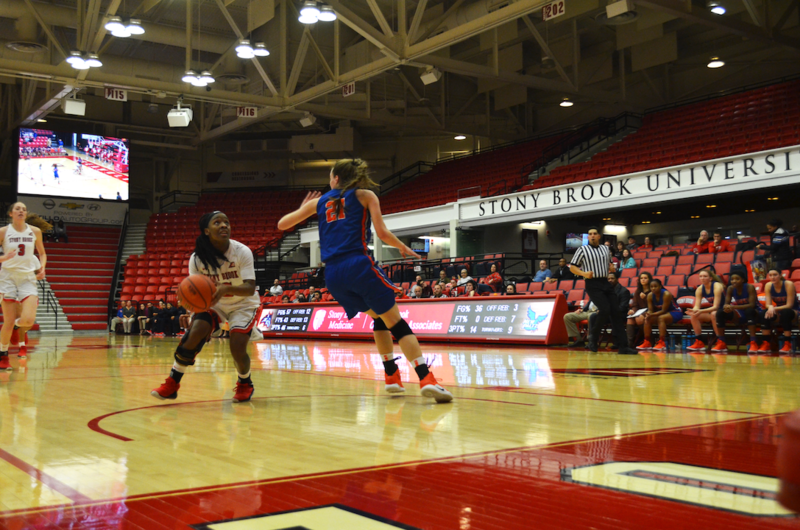 Stony Brook Women’s Basketball fended off the Cornell Big Red’s late comeback attempt in a thrilling 63-61 victory on Saturday, Dec. 1. Cornell sparked a seven-point rally with 3:14 remaining in the fourth quarter, taking a 57-56 lead. Senior guard Shania “Shorty” Johnson fired back by knocking down a three-point shot, giving Stony Brook a two-point lead late in the game. However, junior forward Laura Bagwell-Katalinich tied the game for the Big Red off a layup with 45 seconds left. Johnson commanded the Seawolves offensively, finding sophomore guard Jonae Cox inside the paint for the score and a foul which gave them the lead for good. Sophomore forward India Pagan converted a free throw and gave the Seawolves a two-point lead, but also gave the Big Red one last chance. The game ended on a last second missed jumper that would’ve given Cornell then win. Johnson played tight defense and affected junior guard Danielle Jorgenson’s last-second missed jumper to ice the game for The Seawolves. It was a back and forth first quarter due to the six turnovers committed by Cornell and the slow 29 percent field goal shooting percentage from Stony Brook. “I thought that we came out a little slow compared to how we had been playing so I like how we were able to come from behind,” McCombs said. Johnson excelled on both sides of the court and pulled the Seawolves out of the fourth quarter slump. She controlled the tempo of the game with fast paced ball movement and her three consecutive three point shots energized the rest of the team throughout the contest. Johnson led the team with 17 points and knocked down five three-pointers. Senior guard Jerell Matthews recorded 15 points and tied Johnson with six assists. Junior forward Oksana Gouchie-Provencher helped out defensively, leading the team with seven rebounds and a block while scoring five points. The game was categorized by aggressive defense, opportunistic fast-break opportunities and a tough-fought rebound battle. Both teams grabbed 37 rebounds and held the other to shooting under .45 from the field. The gritty contest was closely fought throughout its entirety. There were only three lead changes, with Stony Brook jumping out to a nine-point lead late in the third quarter. Stony Brook extended its winning streak to six games following the win. Johnson believes the Seawolves’ confidence on the hardwood will determine how far the team could keep the momentum rolling. Stony Brook will look to make it seven straight victories when it takes on the Sacred Heart Pioneers in Fairfield, Connecticut on Tuesday, Dec. 4 at 6 p.m.